You can generate a report from the Analytics Portal using Company Numbers. The are also a number of Key Perfomance Indicators (KPIs) available for this report. The number or percentage of all calls to a company number in which a Voicemail was left. The number or percentage of all calls that were missed (includes Voicemail). The total amount of handle time the user spent on the calls on a company number. Handle time is all live talk time and all hold time. The average duration of a company number call, from answered until terminated. This includes live talking plus time on hold. The number of calls placed on hold for the numbers selected, the average hold time, or the number of abandoned calls put on hold. The number of calls transferred, parked (or answered from park), total park time and the number of calls abandoned while the caller was put on park. Go to Admin Portal > Reports > Analytics Portal > Company Numbers. The Company Numbers Report is composed of 2 tabs. This portion is composed of the KPIs, Trend, and the Company Numbers sections. The Numbers tab allows you to filter the report according to Company Numbers and Call Length. KPIs section – This section lets you customize which metrics should be presented on the Trend section. Selected metrics appear as tabs that can be clicked. Trend section – This part displays a graphical presentation of the selected data from the KPIs section. The selected metrics data is presented on an hourly basis. Click on a different metric from the KPIs section to switch to another graph. Company Numbers section – This section displays a report with the following data:Company Number, the number of inbound, answered, missed calls, the average handle time, the number of holds, and the average hold time. 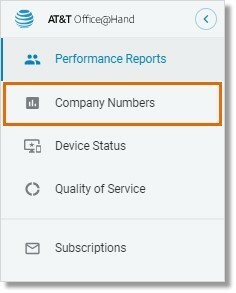 See Analytics Portal – Create Company Numbers Report | AT&T Office@Hand to learn how to create this report.